The ideal manufacturing solution should address the entire supply chain, from product inception to customer delivery. 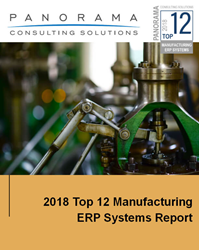 The independent, niche consulting firm, Panorama Consulting Solutions, recently released an independent report for manufacturers evaluating ERP software. The report discusses considerations such as functionality, user experience and cultural fit. The analysis is based on Panorama’s past client experience, vendor RFI and RFP responses, as well as data from reliable industry sources. The vendors featured in the report were chosen based on the strength of their manufacturing functionality and the amount of research and development invested in these products. The report can be downloaded here: https://www.panorama-consulting.com/resource-center/erp-software-research-and-reports/. A webinar reviewing the report can be watched on-demand here: https://www.panorama-consulting.com/resource-center/on-demand-erp-webinars/. Panorama Consulting Solutions is an independent, niche consulting firm specializing in digital transformation and ERP systems expertise for mid- to large-sized private- and public-sector organizations worldwide. One-hundred percent technology agnostic and independent of vendor affiliation, Panorama offers a phased and integrated top-down strategic alignment approach and/or a bottom-up tactical execution, enabling each client to achieve its own, unique business transformation objectives by transforming their people, processes and technology challenges to successfully implement change. Panorama’s services include: Digital Strategy, Organizational Assessment, ERP Selection, ERP Implementation, Change Management, Human Capital Management, IT Staffing, Business Process Management, Business Process Reengineering, Value Stream Mapping, M&A Integration, Project Auditing, Project Recovery and Software Expert Witness Testimony. Learn more at https://www.panorama-consulting.com/. The Bar Code News (www.barcode.com), now in its 9th year, relies on sponors to stay in business. Please let vendors know you’ve seen them here. Use the links on the left side menu to find the products or services you need. Want to reach us? See the links on the Footer menu below. Want it installed? Just scan the bar code. Do It Yourselfers Get A Hand!